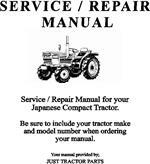 Please note that many of these manuals are with TEXT IN JAPANESE. This is indicated with an (J) by the model number. All others have the TEXT IN ENGLISH and are indicated with an (E) next to the model number. To Place an Order, Obtain Pricing and Any Other Information Please Call Our Parts Department At (760) 240-3336 or Order ONLINE. 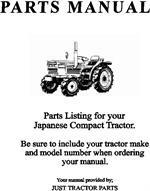 Be sure to indicate YOUR YANMAR tractor model number.